I was introduced to Jonathan through a friend who could not stop talking about his music. I was told that Jon’s music is soulful and unpredictable, and that his metaphors capture the imagination of the listener and take them on a profound journey. His music ranges from eclectic to hip-hop, and literally everything in between. I had the pleasure of being invited to Jonathan’s home to watch him in action. I was extremely excited to see him in his element and have a first row seat. Once settled in his bedroom (where all of the magic truly does happen), I started listening. With all of my friend’s accolades I realized he had seriously understated what I would be a witness to. For the next forty-five minutes I went on a journey of emotions that took me in many directions. Jonathan’s ballads are relevant and give definite substance to his generation. Jon’s artistry has created a unique and heartfelt new genre of music that I firmly believe will change the current landscape of the music industry. I quickly realized that Jon is an artist that could never be put in a box…an artist who could never be labeled or categorized. As I started asking Jon questions, it occurred to me that he is a genuinely cool and humble young man. He is only twenty years old yet his unique, melodic and captivating voice balances nicely against his moving and clever rapping. As if this wasn’t enough, I learned that Jon both composes and produces all of his music himself. 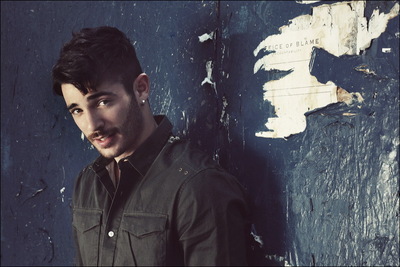 From writing the lyrics, to the beats and the mixing, it’s all Jonathan Bellion. He often produces an entire song, mixed and completed, in one day all from the confines of his bedroom. Jonathan is truly a genius. While feeling very welcome in Jonathan’s home and meeting his family, it didn’t take long to realize how extremely supportive and close knit of a family they were. His sister Christianne, an accomplished singer herself, can be heard accompanying Jon on several of his tracks. Wanting to learn more about who Jon is, I came to find out that he is an incredibly talented athlete as well. A natural born leader, Jon earned All Conference honors and was captain of both his varsity basketball and volleyball teams. Growing up on Long Island, New York, Jon’s first love was basketball, as he had aspirations of playing at the college level. However, in Jon’s junior year of high school it became abundantly clear that music was what he truly desired to invest his life in. Combining exceptional talent and fearless ambition, Jon Bellion is developing what he refers to as a “movement” with the launching of his project, “Beautiful Mind” that has no intentions of following the norm. “It’s not cool to be negative or stupid. We live in a time that needs enlightenment, especially with expression through music” he says. “We’re here for anyone with a beautiful mind.” His unique approach to music has afforded him the opportunity to showcase his sound at exclusive, high profile events such as the Presidential Inner Circle Pre-Grammy Party that took place in Hollywood, California. His song “Moped Girl” was also spotlighted on NBC radio’s “Tha Juke Joint” show. Jon’s first mixtape, “Scattered Thoughts Vol. 1” was released in early 2011 via his Facebook page, and organically reached over 11,000 downloads. His music is so poetically insightful, with his finger on the pulse of his generation and those to follow. One thing I will warn you is that when it comes to Jonathan Bellion and his music, you need to tread carefully. Like me, once you listen, I guarantee you will be absolutely hooked.